Smoky chipotle peppers, rich butternut squash, and creamy pepper jack cheese grills together perfectly in this fall-inspired take on grilled cheese. I know how fortunate I am to be able to stay at home with my baby for her first year. I wouldn’t have it any other way. But the whole “stay at home mom” thing is a bit of a misnomer, as I pretty much can’t handle staying at home for more than a day. Maybe it was because I was holed up for months on end during a tough pregnancy, then housebound shortly after she came along as I nursed my broken ankle (stairs, hyped-up dogs, yeah, fun). It’s like I accumulated this debt of cabin fever over the past year-and-a-half, and I have to repay it by getting out of the house with Miss Thing pretty much every single day. It’s good for me, and she loves it too. We go to music classes, parent-baby groups, library story times … and occasionally, now that she’s eating solids, we enjoy a little lady’s lunch together, just her and I. It was during one such lunch that I discovered the made-for-each-other combination of chipotle peppers, butternut squash, and pepper jack cheese. Miss Thing and I shared a heavenly quesadilla filled with butternut squash puree and pepper jack cheese, topped with carrot shreds and chipotle cream (well, no peppers for her). We “mmmed” and “ahhhed” and, well … okay, fine, the conversation wasn’t exactly scintillating as my vocal little gal gabbed incessantly about ABBA and Dada – and she may have blown a few raspberries at the other restaurant patrons at some point along the way – but otherwise a delicious time was had by all, big and small. Naturally, I set out to duplicate this quesadilla at home (we do spend some time there, after all), but before I knew it – I guess my grilled cheese obsession has something to do with it – I started fantasizing about recreating it in grilled cheese form. And so I did, and it was good. Really good. Chipotle peppers, adobo sauce, and pureed butternut squash slathered on one side; a hefty layer of pepper jack cheese on the other … it’s so simple, yet so scrumptious. It’s smoky, it’s spicy, and it tastes like fall. Maybe I should whip these up for lunch a little more often … I’d probably save a ton of money on fuel. In a small bowl, mix together butternut squash, chipotle pepper, adobo sauce, kosher salt, and pepper. Lay down the bread slices and, using a butter knife, spread 1/4 cup butternut squash mixture on one side of each sandwich. Lay the pepper jack cheese evenly over the top of the chipotle butternut spread and close the sandwich. Generously butter the outside of each sandwich on both sides. In a large frying pan over medium-low heat, cook the sandwiches, flipping often, until golden-brown on the outside and the cheese is melted inside, about 10 minutes. * To make the butternut squash puree, slice a butternut squash in half and scoop out the seeds. Place cut side down on a large baking sheet and bake at 375 degrees for about 45 minutes, until fork-tender. Scoop out the soft, cooked squash and puree in a food processor or blender. White Pizza Grilled Cheese – for-real deliciousness. Artichoke Arugula Pesto Grilled Cheese – yesss. Spinach & Artichoke Grilled Cheese – like the classic dip, only better. Proof that’s possible! Balsamic Strawberry & Brie Grilled Cheese Sliders tasty AND cute. 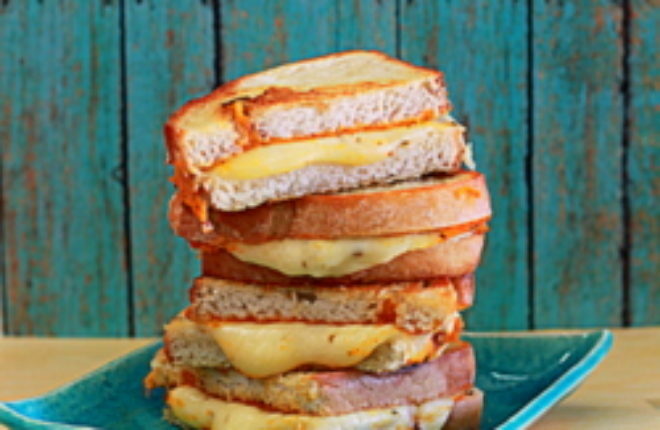 And even more grilled cheese sandwich recipes – 32 melty, gooey, savory, fruity, and just plain over-the-top grilled cheese sandwiches. 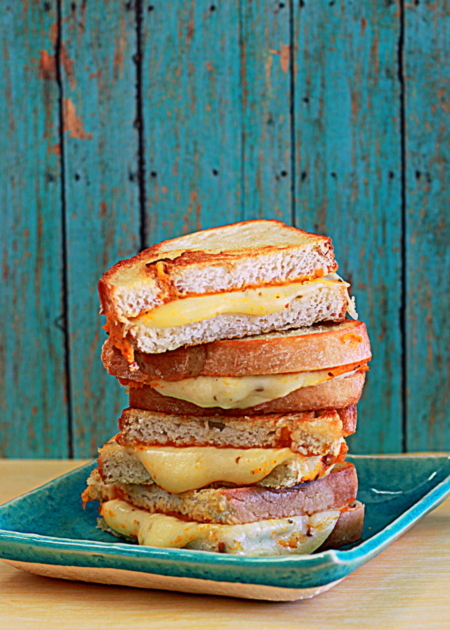 How to Make a Perfect Grilled Cheese Sandwich – because basic is never bad! Here’s how to do it just right. 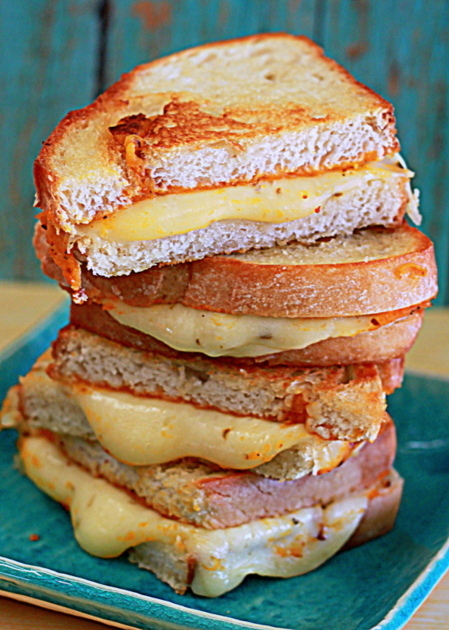 Your grilled cheese sandwiches look so delicious, stacked so high! Beautiful photo! I love this! Chipotle is a great flavor. And I’m with you, I get a bit stir crazy if I stay home too long. Sounds delish! Have you tried adding avocado slices? This looks amazing and I can’t wait to try it. I love both butternut squash and chipotle, so putting them together in a grilled cheese is pure genius. Thought you should know: I found this recipe on a bogus blog that stole both your pic and the recipe. 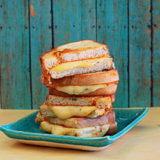 http://omgilovetocook.com/chipotle-butternut-squash-pepper-jack-grilled-cheese/ I hope you can get it removed.